At the risk of annoying the Tesla fans, perhaps it’s time to stop paying so much attention to the so-called Tesla-killers, and start paying attention to the Prius-killers. OK, perhaps killer isn’t the right word, but there’s a serious opportunity for the right Prius-challenger, and it seems like Hyundai has really brought its A-game to the green car market with its 2017 Ioniq. My first impression of the 2017 Hyundai Ioniq was behind the wheel of the hybrid, which I was fairly skeptical of, just based on the numbers we were given as part of the media. An average of 58 mpg, while still offering a driving experience like a conventional car? Get the heck out of here. 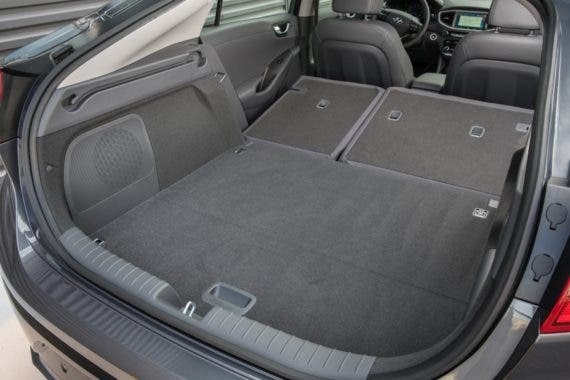 Plenty of legroom and cargo space in a small 4-door hatchback? No way. 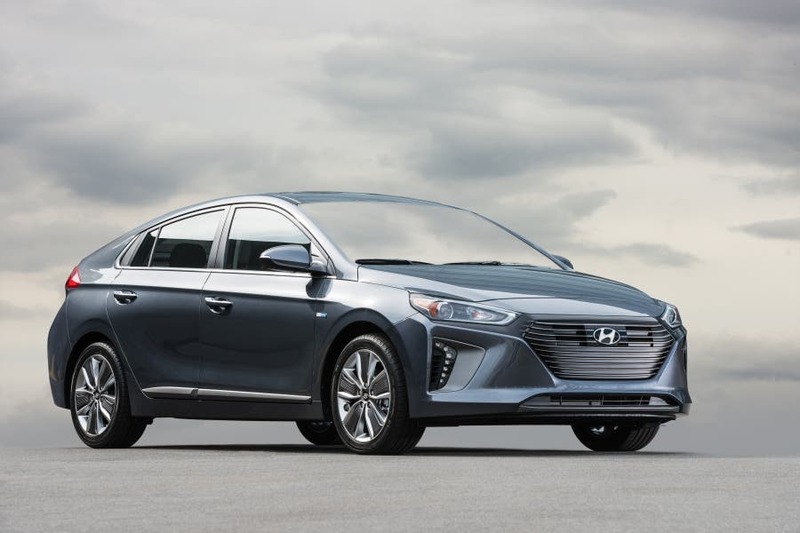 However, I was proven wrong on a number of fronts with the Ioniq hybrid, and once I learned the price ($22,200), I came away with a whole new appreciation for what Hyundai accomplished with this car. The second version of the 2017 Hyundai Ioniq I got to drive was the fully electric model (the plug-in hybrid wasn’t available to all drivers), and although my first thought was that the Ioniq electric only has a 124-mile range (which probably has more to say about our societal conditioning about “range anxiety” than about actual driving habits), I ended up changing my mind about the so-called limitations of that as well by the end of the day. For my time behind the wheel, I gunned it up hills and from full stops, put the regenerative braking at the lowest level, and generally tried to “drive it like I stole it” (at least as much as I could in traffic, anyway), but after checking the odometer against the estimated range still in the battery, that 124-mile range certainly seemed like a solid number, even for a driver who wasn’t trying to hypermile it. I’ll start with the driving experience, because after all, that’s pretty much the main purpose of a vehicle (at least until we get to true self-driving vehicles, at which point the interior amenities will probably take first priority). The 2017 Hyundai Ioniq Hybrid delivered a great compact car driving experience, allowing the driver to simply focus on the road and other traffic when in “Eco” mode, while the car itself seamlessly switched between electric drive at low speeds and the 1.6 liter gas engine at higher speeds. In fact, if you weren’t looking at the estimated miles-per-gallon display while driving it, you’d be hard pressed to even notice that it’s a hybrid. 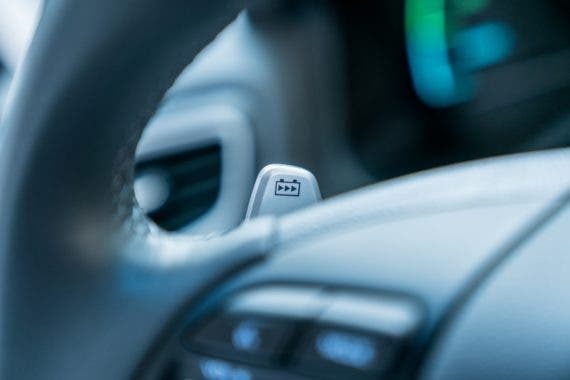 If you’re more of a hands-on driver, and enjoy the visceral experience of powering through corners and driving the car more aggressively, then the Sport mode (accessible by moving the gear selector to the left) is where it’s at. 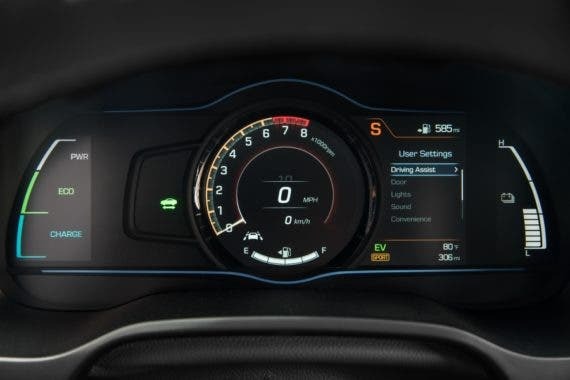 Switching over to Sport mode changes the dashboard to display a digital tachometer, allowing the driver to more accurately change gears manually for optimal acceleration, as well as seeming to adjust the automatic shift points for a zippier feel. While there are some limitations to Sport mode (it’s not like your average manual transmission, that’s for sure), it certainly delivered a more exciting drive, especially considering it’s a $20,000 compact car that gets hella high mileage per gallon. For the first half of our drive in the hybrid, my co-pilot drove it in Eco mode, and we got upwards of 50 mpg (per the car’s display), so when I got behind the wheel, I decided to see how low we could get the mpg by driving it aggressively in Sport mode. And I failed miserably, but not for lack of trying. I revved it high in each gear before shifting, took off as quickly as I could from a full stop (it’s not a drag racer, by any means, but it still had plenty of guts for most drivers contending with high speed merging and passing), and put the hammer down going up every hill. At one point, I had the car showing a miles-per-gallon rating down in the low 40s, but that was as fuel inefficient as I could get it with a mix of city and highway driving. Perhaps that would change on a much longer route, over more demanding altitude changes, but in our half-day in the car, I was impressed by the performance of the hybrid. The main difference was the almost complete lack of noise, other than some slight road noise from the tires, and the gear shift was missing (replaced by buttons for selecting drive, reverse, Eco and Sport mode, etc. ), and the lack of oomph off the line. The Electric accelerated just fine, and could hold its own in traffic, but it certainly didn’t seem to have the same “launch” feeling that the Hybrid did from a full stop. One feature that I really liked about the Ioniq Electric was the ability to quickly switch between several levels of regenerative braking, via two paddles on the steering wheel. At the lowest setting, the car drove very similar to a conventional vehicle, with plenty of coasting possible when taking your foot off the accelerator, while at the highest level, the regenerative braking feature allowed for a “single pedal” driving style, which meant that as soon as your foot was off of the accelerator, the car started slowing down quite aggressively — not enough to come to a complete stop, but enough that touching the brake wasn’t necessary when accounting for curves and slowing traffic. 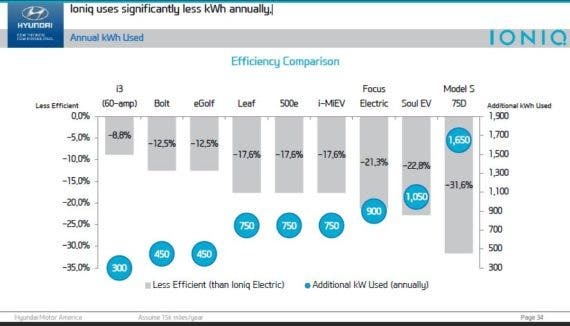 I could see the usefulness of the high level of regen braking when trying to get the most range out of the car, while the lowest level gave you the feel of driving a conventional car — something that might come in handy when transitioning from a conventional or hybrid to a fully electric car. That said, the Electric had plenty of power for the route we were on (which had no incredibly steep or sustained grades), and wasn’t a stodgy “green car” that sacrificed all of the fun of driving in order to deliver a more sustainable transport option. As with the Hybrid, for the first half of our time with the Electric, my co-pilot drove it mostly in Eco mode, so when I got in the driver’s seat, I put it in Sport mode and kept it there, with the same aim as before — to see if I could put some holes in the company’s range claim. This time, even with some pedal-to-the-metal takeoffs and punching up hills, we ended our drive of the day with the car giving us a range estimate very much in line with the company’s stated 124 miles after subtracting the miles we’d driven. During the media session at the beginning of the day, I actually asked the Hyundai Ioniq product team about the range estimation, saying that I assumed that the 124 mile range was for cautious drivers, so what would the “drive it like you stole it” worst case scenario be for the Electric? Unsurprisingly, they didn’t have a definitive answer (I’m picturing them saying to themselves, “Silly blogger, why would you want to ask such a dumb question?”). Although, they stated that the 124 mile range was a “realistic” range, and could probably go higher depending on the route, the driving style, and a number of other variables. The Ioniq’s large rear pillars took some getting used to, visibility-wise. Although, the vehicle’s Blind Spot Detection system did a good job of alerting me to cars coming up behind in the other lane. For rear visibility, the hatchback-style rear had what I felt was a strange split-window feel to it, with a “bar” across the middle of the rear window (for the brake lights) that I didn’t see the point of until noticing that the lower section was actually what would have been a solid rear part of the hatch in an older vehicle, and which ultimately gave a bit more visibility out the rear. Other than those two little gripes, both of which I quickly acclimated to, the visibility in the Ioniq was good, although nothing spectacular. The Ioniq has a number of “advanced” safety features, including the aforementioned Blind Spot Detection, Lane Departure Warning, and Automatic Emergency Braking with Pedestrian Detection. I have to admit that I’m not a huge fan of the “nanny” features like the lane-keeper and blind spot alerts. Though, I can certainly see their usefulness in helping to increase road safety (and would probably come to love those features on long drives or in heavy traffic and low visibility conditions). Although the interior of a vehicle is an important part of how much we love (or hate) our cars, I’m not so sure that people are buying affordable compact cars because of how luxurious their interiors feel. 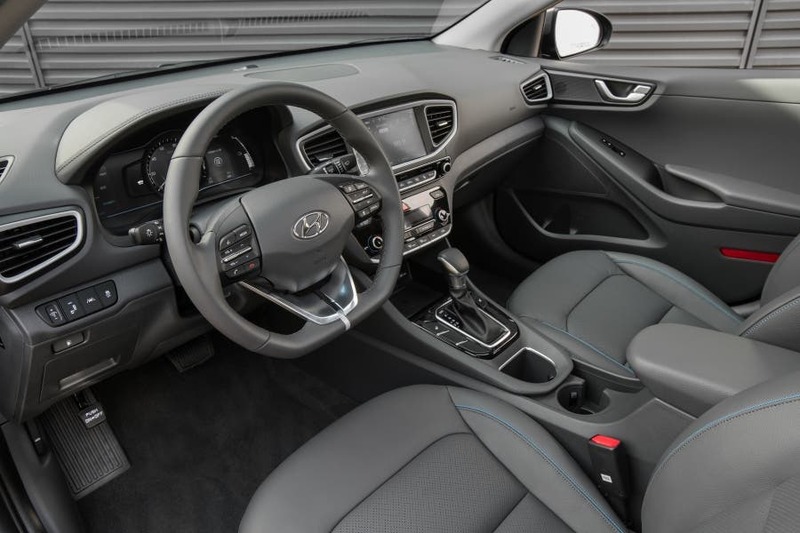 I’ve read some other reviews of the Ioniq that bemoaned the “plastic-y” feel of the interior, but I didn’t notice anything exceptionally cheap about the interior. According to Hyundai, the company incorporated sugar cane fiber as 25% of the raw materials used in the door trim panels, and recycled plastic “combined with powdered wood and volcanic stone,” which reduced the weight of “some interior plastics” by up to 20%, so there’s a bit of an eco side to the interior trim. For me, the most important part of the interior is the apparent roominess, and while I’m not a “big and tall” person, I felt like there was a spaciousness to the Ioniq that certainly didn’t feel like a compact car. The rear hatch area was large enough for most uses, and the rear seats fold down (in a 60/40 split), allowing for those times when you need a larger cargo bay. The driver’s seat had plenty of electronic adjustment available, which makes for a more comfortable driving experience (and the ability to quickly switch it up when on a long drive), and the front passenger seat folded almost completely flat, which means your co-pilot can catch some Zs on those long road trips. A wireless charging bay for smartphones seemed like a nice touch for today’s gadget-centric crowd, and there were several USB charging ports up front, plus multiple 12V outlets available as well. 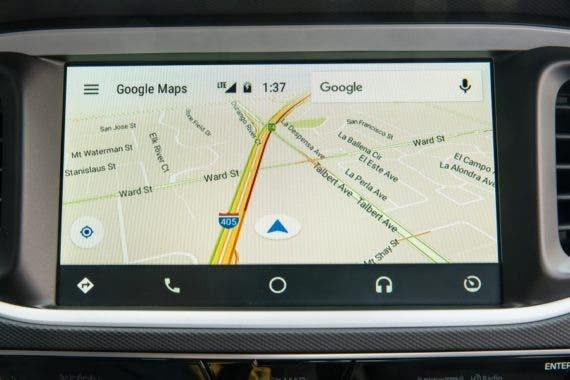 The Ioniq had what seems to be somewhat standard in new vehicles these days, a touchscreen “infotainment” display in the middle of the dash, with the ability to connect your mobile gadget via Android Auto or Apple CarPlay, neither of which we tried out during our test drives. The stereo system was a decent, modern, middle-of-the-road car stereo. Although, for a guy like me who still loves his cassettes and CDs (what?!? ), and likes to be able to plug in an aux cord instead of Bluetooth (hey, don’t judge), it meant that I had to have a smartphone in order to really use anything other than the radio functions. 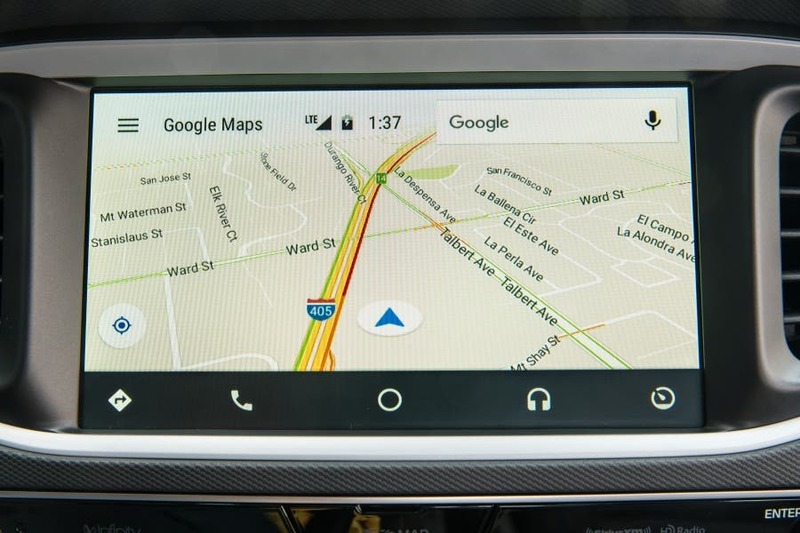 One helpful feature that I thought was missing, although perhaps I just couldn’t find the right menu, was access to the user manual via the infotainment screen. Although I don’t think that having the user manual available from the dashboard is a crucial feature, as someone who likes to know the ins and outs of a vehicle, I certainly would have put it to use. For the Ioniq Electric, with its 28.0 kWh lithium-polymer battery pack, a full charge on a Level 2 charger is said to take about 4 hours and 25 minutes, while a 100 kW charger could deliver an 80% charge in about 23 minutes, and a 50 kW charger could deliver an 80% charge in about half an hour. We didn’t experience the charging process at all, so I can’t speak to that, but after some thought about the so-called range anxiety that some prospective EV buyers face, especially when they hear that the Ioniq Electric has only 124 miles of range, there are a few conditions which would seem to make the Electric a good fit. One is access to 100 kW charging stations along your route, and the other is regular driving habits of less than 120 miles or so in one direction. Perhaps I’m just used to having kids that need regular bathroom breaks on the road, but I no longer like to drive more than two hours at a stretch anyway, so if I could make regular pit stops at places along my route for a 20-minute fast charge, during which time we can all hit the bathroom (and I can get coffee-d up), the Electric would be a good fit for me. That being said, where I live, in rural southwestern New Mexico, the EV charging infrastructure is minimal at best, so I’m not a good candidate for buying an electric Ioniq unless I also had a second car for those longer trips. For my daily and weekly driving habits, a full electric would be perfect, but we regularly make trips much longer than the 124 mile range, along routes without EV fast chargers, so we’re more likely to buy a hybrid or plug-in hybrid for our main vehicle. 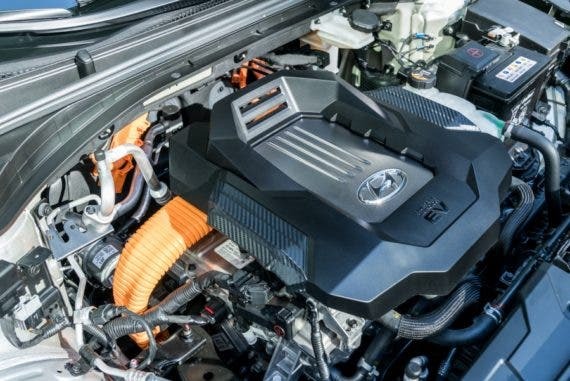 One aspect of the Ioniq Electric that may get lost in the hype about Tesla’s crazy-fast 0–60 mph times, or the Bolt’s longer range (which is a valid point if you have longer daily driving habits), is the efficiency rating of the vehicle. The 2o17 Hyundai Electric is rated at 136 MPGe, which makes it the most efficient vehicle on the road, and while that MPGe isn’t as well known as MPG is, and we’re not accustomed to using the measurement of miles per kilowatt-hour (which we should be getting used to), it’s still a valid metric. While the Tesla Model S might be more luxurious vehicle overall, and have a much more powerful drivetrain (and a much higher price), it’s also a much less efficient vehicle to drive, according to the chart below. The 2017 Hyundai Ioniq Hybrid comes in three different versions — the Blue, priced at $22,200; the SEL, priced at $23,950; and the Limited, priced at $27,500, before any incentives, and with a freight charge of $835 for all models. At that pricing, the Ioniq Hybrid is a great deal, in my opinion, considering the other cars in that class. For the Hyundai Ioniq Electric, the 2017 model will be priced at $29,500 for the basic version and $32,500 for the Limited version (before any incentives and including the $835 freight charge). Pricing for the plug-in hybrid Ioniq hasn’t yet been announced. My overall impression of the Ioniq is that it’s a solid car at a great price, both the Hybrid and the Electric, and it very well could be the sleeper that gets awakened once people realize they can get a quality compact car that also happens to be an excellent green vehicle, but which doesn’t look like one. Honestly, after a day behind the wheel of the Ioniq, I was quite impressed, but when I heard the pricing for the 2017 Hybrid, I was like, “Seriously? Take my money.” The pricing on the Electric is also impressive, and might be a serious contender for those considering the Bolt or the LEAF, but for my needs, a hybrid that gets 58 mpg for just a bit more than 20 grand is well worth considering. If you absolutely need a longer electric range, or have more money to spend to get a luxury interior, or all the bells and whistles, or you’re a driver’s driver who wants their “green” car to be on the cutting edge, then by all means, I would suggest shopping around a lot more (or perhaps you’re already on the waiting list for the Model 3). But if you want a great small car with excellent mileage, then I recommend checking out one of the 2017 Ioniq models. Learn more about the vehicle at Hyundai USA, and compare to other electric cars here or here.